Presenters Nick Groff and Katrina Weidman spent 72 hours on 'lockdown' at the 'Skegness Hell House'. An abandoned home near Skegness - believed to be haunted it has been dubbed a ‘Hell house’ - is to feature in a TV show tomorrow (Thursday). 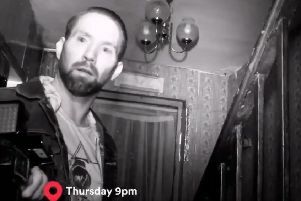 Paranormal Lockdown UK was originally scheduled to be screened last week, but presenter Nick Groff tweeted ahead of the show that ‘something spooky’ had happened with ‘technical issues’ which meant the episode was postponed. The episode will feature Groff and fellow investigator Katrina Weidman locking themselves in the unoccupied house near Skegness for 72 hours. Speaking to The Standard yesterday, the former Ghost Adventures star said the house is a ‘very interesting location with a good amount of history in the area’. It believed the house is currently unoccupied, but the family that previously lived there claimed to have been ‘tormented’ for decades by spirits. Nick Groff pictured during his investigation at the house. Paranormal Lockdown UK will be screened on QuestRed (freeview digital channel 38). It can also be streamed live on QuestRed’s website. The so-called 'Hell House' as pictured on the TV show's trailer.